(5:30 p.m. EDT) -- MSC Cruises has its sights set on yet another cruise terminal in Miami. Miami-Dade County along with MSC have signed a Memorandum of Understanding (MOU) for the construction of Terminal AAA, a brand-new terminal meant to accommodate MSC Cruises' forthcoming World-class cruise ships, according to Cruise Industry News. The new terminal is expected to be complete by October 2022, when the first World-class ship is expected to debut. The ship will have a passenger capacity of about 6,850 passengers and will be powered by environmentally friendly liquified natural gas. The pair also signed an agreement to extend preferential berthing rights from Saturday only to also include Sunday. MSC Divina and MSC Seaside share berthing rights at Terminal F in PortMiami, a custom-built terminal for the cruise line that debuted just weeks before Seaside in December 2017. "In 2017, MSC Cruises worked with PortMiami on the completion of Terminal F, home to MSC Seaside, the first MSC Cruises ship to be built specifically for North American market and the Caribbean," said Roberto Fusaro, president of MSC Cruises USA in an article by Cruise Industry News. "The construction of another cruise terminal is further testament of our commitment to U.S. travel partners and their guests, as it will allow us to continue to enhance our service, starting right from embarkation." "The new agreement and expanded partnership with PortMiami and Miami-Dade County is another key step forward in the business growth of MSC Cruises, as we continue to strengthen our global footprint, with a strategic focus on North America," said Pierfrancesco Vago, executive chairman of MSC Cruises, in Cruise Industry News. 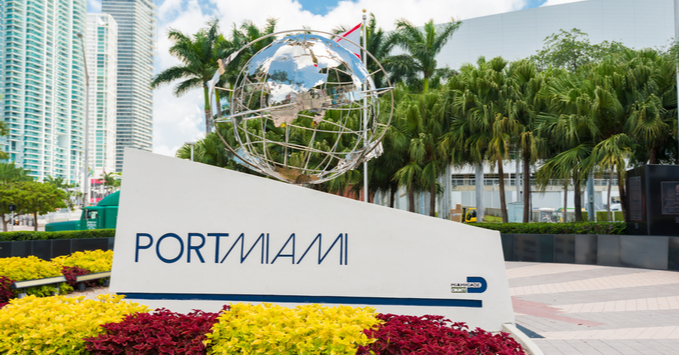 "Investing in PortMiami's infrastructure positions Miami-Dade County as a global destination for visitors," said Miami-Dade County Mayor Carlos A. Gimenez in Cruise Industry News. "The construction of a new cruise terminal AAA with the capacity to berth an additional 7,000-passenger cruise ship represents thousands of jobs and increased opportunities for our community. We are grateful for MSC Cruises continued partnership." The announcement of the new cruise terminal comes on the heels of launching MSC Seaview, its second Seaside-class ship, just last month.